How To Play the Mini Games! Once you get there you will see 6 different games to play! Number 2- Cart Surfer ~ Choose the to use the touch screen or the control pad and A button to perform tricks and earn coins! Use the center touch screen icon or the A button to jump. Watch the track for signs warning you of incoming obstacles. Lean left or right when you see the yellow arrow signs pointing left or right. Jump or sit down when you see the yellow arrow signs pointing up or down. Use your thumbs to activate the desired move when controlling the cart with the touch screen. Number 3- Ice Fishing ~ lower your line with the stylus on the touch screen to catch fish and earn coins. Your worm bait will work with most fish, but the bigger fish will only bite if there's a smaller fish on the hook. Once you've caught something, release the line to reel in the catch! Reel it up quickly to avoid hazards like jellyfish, crabs, and sharks! Try to use the fish and squids to reel in extra rewards! Use the squid to reel in a treasure box! Use the fish to reel in a mullet! Number 4- Jet Pack Adventure ~ Use your stylus on the touch screen to steer your jet pack across the skies. find the landing pad to complete the game! Collect items to earn coins and regain fuel! Watch out for flying obstacles, they will reduce your fuel! Number 5- Dance Challenge ~ Use the touch screen to match the direction of the arrows with the stylus. 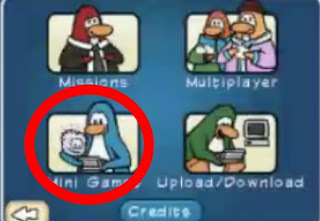 Copy the penguin's dance moves to earn coins! Go longer without making a mistake to get more coins for each correct dance move! 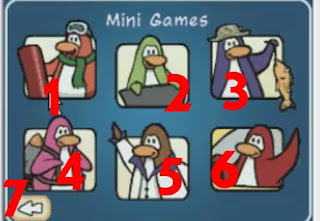 Penguin friends in the crowd show you how many tries you have left. Number 6- Snow Trekker ~ Use the stylus on the touch screen to steer the snow trekker and avoid obstacles. Race to the goal before the time runs out! Tap the snow trekker on the touch screen to activate the boat and plow modes. use the plow mode to remove obstacles in your path. Blow air into the microphone to make the snow trekker move in boat mode across water! Number 7- Go back ~ This button allows you to go back to the previous screen that you were last in!